Tecnolam srl was born on the province of Pesaro (Italy) along the historical Flaminia way. We have been producing tools order systems for 40 years. All the associates of the company work with a strong sense of responsibility which guarantee superior productive performance. During the years Tecnolam has increased and completed his operating structure with machineries for the molding of plastic materials, for the wood manufacturing and for the plate manufacturing. Our wide range of machinery put our company among the few European companies that sales what they produce. Nel corso degli anni Tecnolam ha ampliato e completato la sua struttura operativa con macchinari per lo stampaggio di materie plastiche ed apparecchiature per la lavorazione del legno, che associati alle macchine per la lavorazione della lamiera, la pone senza dubbio tra le poche o addirittura uniche aziende europee che realmente producono ciò che vendono. The tenacity and the willing to be well-advanced in his field is also proved by the certificate ISO 9002 that we obtained in 1994 when the 95% of the enterprises do not have it. In these years, Tecnolam has become more complete and international thanks to the incessant and always higher demand, opening new foreign factories. Today Tecnolam in addition to his line of products, realize also personalized solutions for other brands in the field of van equipments. This because of our really productive spirit which among 40 years has always characterized our society making it shine with its attention to the details and its well-advanced machinery. 3000 active clients all over Europe with 200 sales point and dealership. 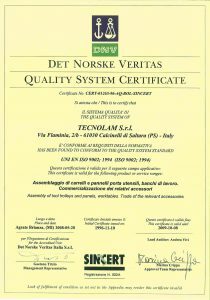 Tecnolam is a real productive company who has an innovated strategy capable of competing against any rival in a National and International level.